Robe once again was right at the heart of the action in South Africa when specified for filming of the newest South African TV talent show series, ‘Clash of the Choirs’. The Endemol SA produced talent show presented by Bonang Matheba was broadcast on DSTv channel Mzansi Magic and had massive impact in a country with a fantastically rich musical culture of choir music and performance. Seven amateur choirs from different provinces were mentored by celebrity musicians and are competing for a prize of 500,000 ZAR, 250,000 of which goes to the winning choir and 250,000 to a charity of their choice. The first series’ rounds were recorded at the new Soweto Theatre, Nr Johannesburg, Gauteng Province, and the final will be battled out by the top three choirs this month. Lighting for the series was designed by Peter Reick from Blond Productions. The rig included over 100 Robe moving lights which were a combination of Blond's own hire stock and the Soweto Theatre’s in house rig. The full Robe count totaled 12 MMX Spots, 48 LEDBeam 100s and 12 Scan 575XTs supplied by Blond, which were joined by 12 ROBIN 600E Spots and 30 LEDWash 300s owned by the theatre, all programmed and controlled by Reick running a grandMA2 light console. 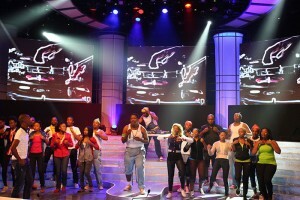 Blonde devised the whole visual concept for the show and also supplied the sound, LED screens and set – the latter designed by Wayne Sproule from Pendragon Dezigns and built by Dream Sets. The gently curved design was based around 10 vertical columns and a scenic ‘horseshoe’ flown above, all made from white fabric stretched over metalwork superstructures, which Reick was able to light very effectively. 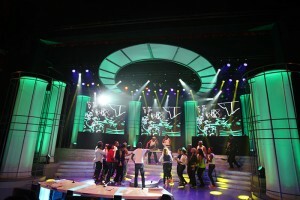 Two imposing sets of steps onstage provided different levels on which the choirs – of 20 members each - could perform. The challenge was fitting an elaborate stage set into a relatively compact space, but the results were very pleasing and expanded the perceived size of the space, making it appear far larger. The stage area needed lighting very carefully to perpetuate this impression of largeness, so lights were integral to the visual plan from the start. Lighting also had to be capable of covering the whole stage area evenly – at peak times up to 140 people could be on it! The MMXs were positioned upstage at the back behind the horseshoe and used for gobos and beam effects for which they are renowned. They were supported by the ROBIN 600E Spots which produced variations on these effects. The LEDBeam 100s internally lit the columns – their small size and high brightness ideal for the job in hand. The LEDWash 300s were dotted all around the rig and used to create powerful and comprehensive basic stage washes as well as to highlight the columns externally. They were extremely efficient for these tasks. The judges table meanwhile was internally lit with Anolis ArcLink 4 RGBW. The theatre setting provided an interesting and atmospheric backdrop for the new series complete with live audience with the lighting helping to create a studio vibe, and the show quickly attracted a massive following. Says Blond's Christiaan Ballot: "This was a great project to work on – it’s always exciting being involved in the first of a new series! It was even better that we could utilise some of the house rig – and that they happened to have Robes. 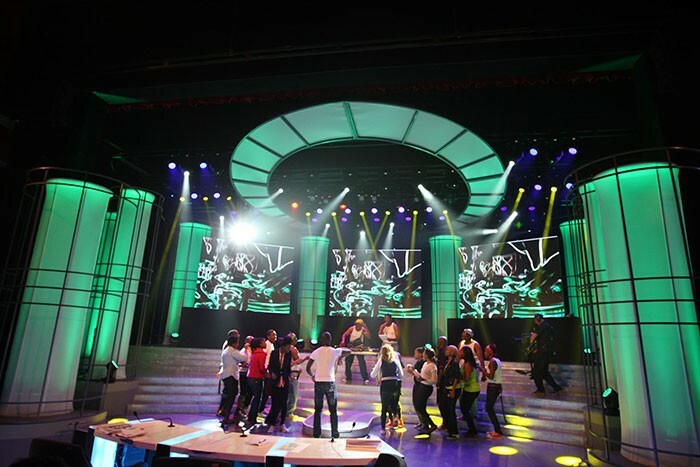 Once again Robe proved to be a versatile and flexible choice of fixture and helped all of us produce a unique look for this TV production with its own distinct sense of style."